Upton Beall Sinclair was an American writer. A Socialist, he was influenced by works by Karl Marx, Jack London, and Frank Norris. Sinclair was born in Baltimore, Maryland, on September 20, 1878, to Upton Beall Sinclair and Priscilla Harden. Sinclair developed a passion for reading at an early age. He attended City College of New York and wrote articles for magazines and dime novels to help pay tuition. He learned to speak several languages. He also attended Columbia University. In October 1902 Sinclair married Meta Fuller and continued publishing works, with greater influence from Frank Norris. 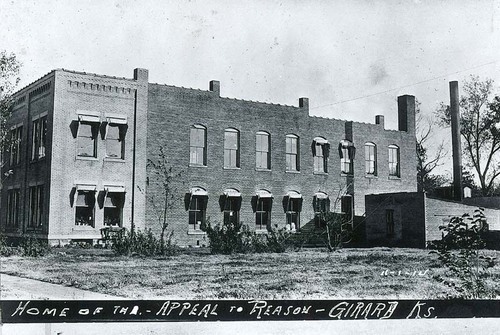 In 1904 the editor of the Girard, Kansas, based Socialist newspaper, Appeal to Reason, contacted Sinclair to write a serial publication for the paper. Sinclair accepted and he began to investigate working conditions in the meat packing industry in Chicago, Illinois. Sinclair spent six months conducting research into work conditions, immigrant life, and production quality. Over a nine month period, from February 25, 1905, to November 4, 1905, Sinclair published his findings and writings as a serial for the paper. In 1906 the writings were published as a novel entitled The Jungle. The novel focused on an immigrant and the conditions in which he worked while employed at a meat packing plant in Chicago, Illinois. As a result the nation became engaged in discussion on working conditions and production quality. Some were outraged and called for legal action; others were doubtful about the factual nature of Sinclair’s findings. One such person who was privately doubtful was President Theodore Roosevelt. He wrote to Kansan William Allen White that when it came to Sinclair and his writings, “I have an utter contempt for him,” Roosevelt wrote. “He is hysterical, unbalanced, and untruthful. Three-fourths of the things he said were absolute falsehoods. For some of the remainder there was only a basis of truth." Despite his personal opinion of Sinclair and his Socialist leanings, Roosevelt publicly felt that it merited enough to order an investigation into the industry. The fallout from the novel and the investigation was widespread. New laws, such as the Meat Inspection Act and the Pure Food and Drug Act were passed as a result. In addition, both foreign and domestic purchasing of meat made in America fell by almost 50 percent. Original examples of the writings in the newspaper were thought to be lost until a discovery almost 80 years later. Kansan Gene DeGruson found many molded and badly damaged pieces of newspaper in a cellar in Girard, Kansas. Upon further examination, DeGruson found Sinclair’s name several times. Some pieces were identified as correspondence between Sinclair and editors of Appeal to Reason. In 1988 DeGruson published what he called an “unexpurgated edition” of The Jungle, entitled The Lost First Edition of Upton Sinclair’s The Jungle. It included Sinclair’s original correspondence. Sinclair’s involvement helped gain visibility for the Kansas-based Socialist newspaper. He led the charge against working conditions in the meat packing industry in Illinois. He died in Bound Brook, New Jersey, on December 18, 1968.